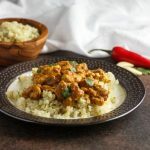 Keto Chicken Korma is a low carb, gluten free, tangy Indian spiced chicken dish with paleo options. Place garlic and ginger, in a food processor and blend until smooth; set aside. Heat ghee or butter over medium heat. Add onion, and cook until soft, about 3 to 5 minutes. Add and mix in the garlic & ginger paste.Add coriander, garam masala, cumin, turmeric, and chili powder. Stir until combined. Stir in diced chicken, and cook for about 5 minutes. Pour tomato sauce and chicken broth over chicken. Heat until broth starts bubbling, then cover, reduce heat, and simmer for 15 minutes, stirring occasionally. In a food processor add: almond butter, coconut milk and yogurt. Process until smooth. Stir the almond butter coconut milk mixture into the chicken and sauce. Cover and simmer on low heat for 10 to 12 minutes, stirring occasionally. Serve. Can also serve over cauliflower rice. Servings:5, Serving Size 1/5 of the recipe.